Southern California is a hotbed of geothermal activity and plate tectonics, which can have the effect of creating an ever-creeping dread of the inevitable earthquake. But instead of living in perpetual fear of the “Big One”, outdoor-loving types in SoCal can take advantage of the plus side of an active geothermal region—proximity to an abundance of hot springs. And—bonus for backpackers—several of these magical spots are only accessible via hardy hikes, which is a great way to weed out hordes of tourists, not to mention beckon a worthy reward for miles on the trail and the resulting achy muscles. So, for a resplendent escape from the sprawl and bustle of the Los Angeles area, grab your backpack and bathing suit and hit the trail to explore these four incredible hot springs in Southern California—Mother Nature’s best day spas. Located just two hours from Los Angeles, north of the vineyard town of Ojai, Sespe Hot Springs are tucked deep into the Sespe Wilderness. Despite their proximity to a major metropolitan area, these hot springs feel indefinitely wild. 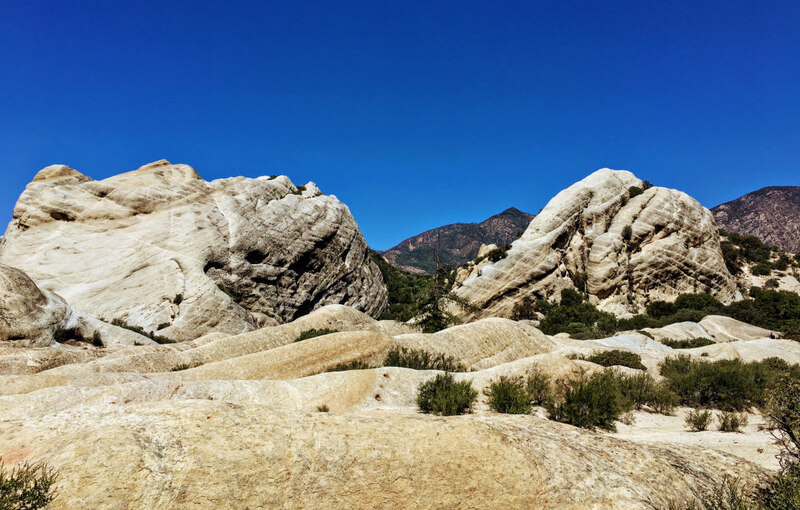 The Sespe Wilderness area features soaring white sandstone cliffs, long bare bluffs, and Sespe Creek cutting through the center. This area is also home to bighorn sheep, mountain lions, and some of the last remaining condors in California. The springs themselves bubble from the rock face at several points along the valley floor. The farther you walk up valley, the hotter the springs will be—until you reach the top spring, which boasts some of the hottest water in California. (It’s been measured at 194 degrees Fahrenheit, so be sure to dip in a toe beforehand to avoid a serious scalding.) The tubs at Sespe are built into the creek with natural stones that form small pools. Find your ideal soaking spot by scouting down creek until the temperature is just right. Set up camp along the sandy valley floor near the water. Getting into Sespe Hot Springs provides its own fun challenge. The most straightforward way is to hike 19.5 miles from the Piedra Blanca trailhead on the western side of the wilderness. This route passes by the disappointing Willet Hot Spring—a rubber cistern in the ground that’s filled with algae—as it follows the Sespe Creek. While this route is by far the longest, it has minimal elevation gain and access to water almost constantly. An alternate (and more fun) route is to follow the Johnson Ridge Trail from the northern trailhead. 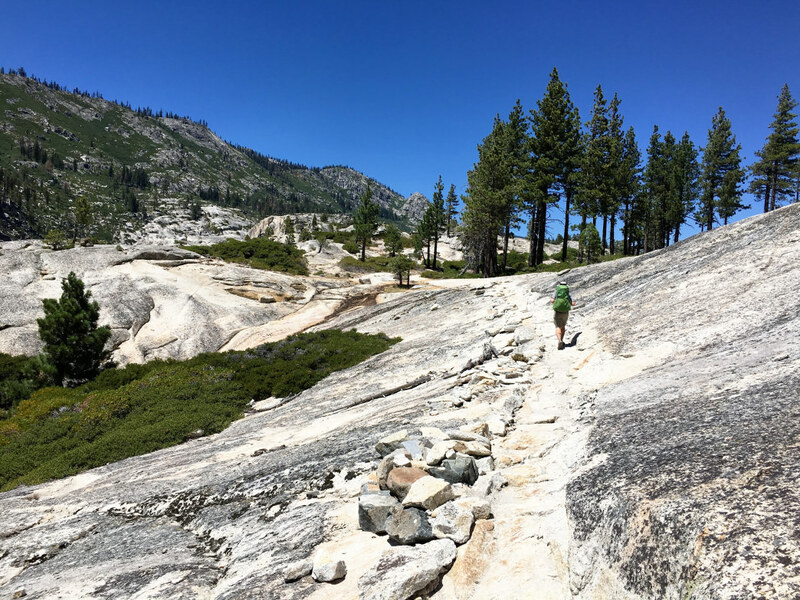 This route follows an exposed ridge 9.5 miles down to the hot springs, giving hikers a commanding view of the Sepse area, a downhill approach to the springs, and nearly half the distance. However, the Johnson Ridge Trailhead must be reached by the unpaved Grade Road, which may cause some sedans to struggle (an SUV or all-wheel-drive vehicle is a better choice.). Plan your visit during the fall through spring, as the summer months can be brutally hot. Sprinkled outside of Mammoth Lakes, these are perhaps some of the most well-developed backcountry hot springs, with everything needed for a great weekend retreat. Six pools are scattered around numerous flat camping areas complete with their own fire pits; a year-round creek tumbles through camp, too. The Iva Bell springs are delightfully free of any eggy sulfuric smell, with clear water, and temperatures in the low 100s. The springs cascade down a hill in disjointed pods with the upper springs the smallest and least developed but hottes. The three lower pools are large enough to fit eight people each, with water that comes to about mid-thigh. Plan your trip for the summer months as the road the Red’s Meadow is closed during the winter. Remember that permits are required, but there are also a handful of walkup day permits you can snag at the Mammoth Visitors Center. 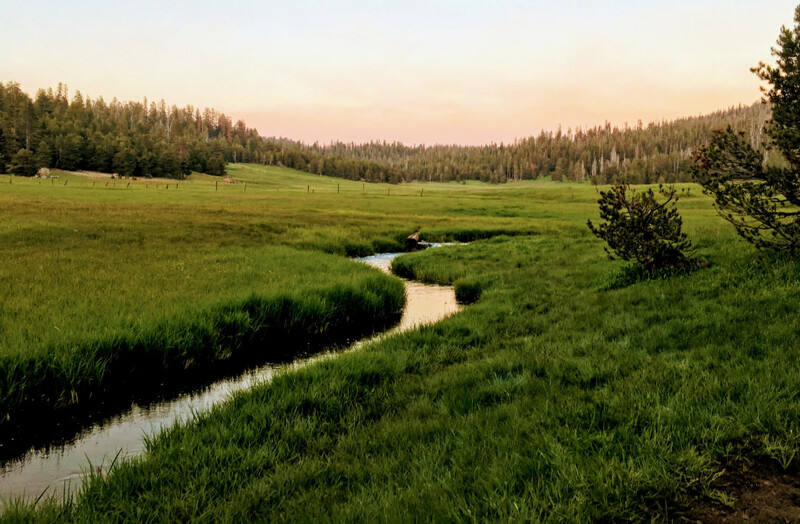 From Mammoth Lakes, take the $7 Red’s Meadow shuttle and get off at the last (#10) stop at Red’s Meadow. Leaving Red’s, you will follow the Carter Creek Trail 11 miles as it first winds its way along granite hills, before dropping almost 1,000 feet into deep forest as you descend toward Fish Creek Valley. Once you’ve reached the creek, follow the trail left up the valley to reach the springs after another three miles. These springs are accessible year round, though they are easiest to access during the spring through early fall months. Jordan Hot Springs stands unique among its backpacker-only brethren for being the only hot spring on this list that was once a developed resort. Prior to 1990 and the creation of the Golden Trout Wilderness, visitors could pay to have themselves and their stuff shuttled down to the hot springs via horseback. But now the only way in is hiking. To access Jordan Hot Springs, start at the Black Rock ranger station on the southern end of the Golden Trout Wilderness. From the ranger station, follow signs six miles and 3,000 feet down, through pine forest that meanders along a creek. Once the trail begins to mellow you’ll come out into a clearing that has a large fire pit and several dilapidated buildings from the time the spring was a commercial venture. From the campground, the springs are just a few hundred feet down the trail. They are made up of a seven-person pool, a warmer single-person pool, and a trough that’s perfect for washing your feet in. Spring and fall are the best times to visit, with a small crowd likely on busy weekends. The Kern River Hot Spring is an outdoor paradise: a single spring flowing into three pools along the shores of the Kern River, below massive towering cliffs surrounded by a thick forest of pine trees, with waters ranging from 100-115 degrees, situated along the shores of the Kern River. But it also requires some serious effort to get to. Furthermore, in researching these springs online you’ll find many people pointing to the Remington Hot Springs, which—aside from being the wrong springs—are often crowded, situated right along a road, and can attract some less-than-savory characters. The most popular way to get to the Kern River Hot Springs is by hiking the High Sierra Trail hitting the springs along the halfway point of your trek around mile 36. However, if doing a 72-mile thru hike of the HST isn’t feasible, there is another way to approach the springs. The shortest means of getting into the Kern River Hot Springs is via a 20-mile hike—with close to 6,00 feet of gain—departing from Mineral King Ranger station, heading over Franklyn Pass, and then descending along Rattlesnake Creek toward the Kern River and following the river to the hot springs. 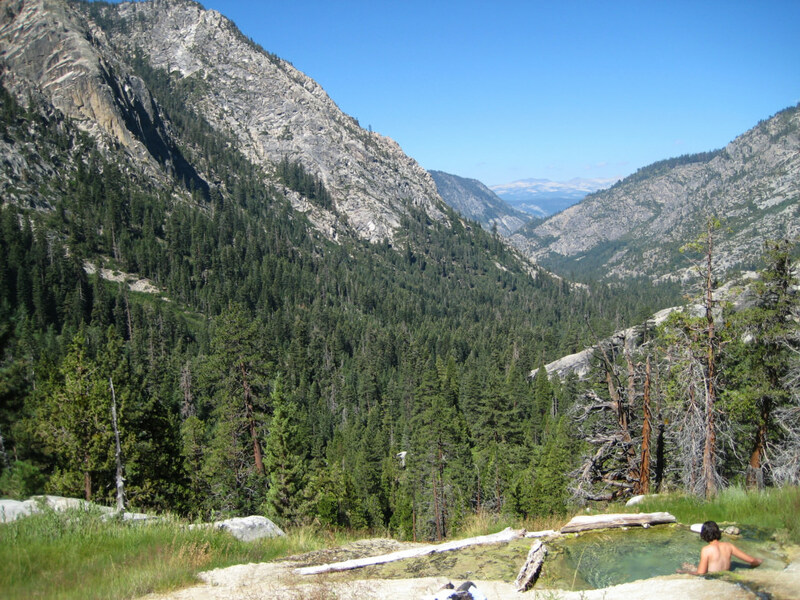 While getting to the Kern River Hot Springs is by no means an easy feat, the scenery alone, especially around Mineral King, is an enticing way to explore some of the lesser explored sections of Sequoia National Park. This hike requires a permit, which can be reserved online through the National Park Service, or can be obtained as a walk-up permit. The best window for attempting this hike is late spring through early fall, when you can take advantage of the warmer temperatures and the snow-free trail.